Home \ Pai's Kitchen \ Fortune Cookies – DIY Gift Idea! Fortune Cookies – DIY Gift Idea! My Best Chocolate Chip Cookies – Crispy & Chewy! The most meaningful gifts are ones you put time, effort, and thought into. 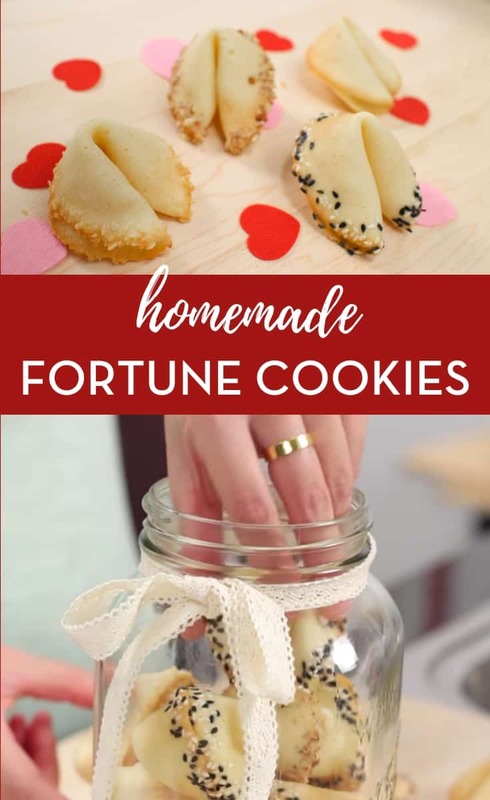 These fortune cookies are the perfect edible gifts that you can personalize them with heartfelt messages, or use the fortunes inside as a way to tell them about other gifts you’ve got planned! They make great Valentine’s Day gift, but they’ll also work for birthdays and other occasions. Enjoy! Note: You can also just put granulated sugar into a coffee grinder, food processor or blender to create superfine sugar. Note: If this is your first time making these, I recommend making just a couple for the first batch to see how they turn out, so you can adjust the amount of batter and timing/temperature of the oven as needed. Preheat the oven to 350°F and set the rack in the middle of the oven. Whisk egg white until frothy (no more big bubbles). Add sugar and whisk together till smooth and glossy. Add vanilla and salt; whisk to combine. Add flour and whisk just until smooth. Whisk in melted butter. Prepare a flat (not warped!) sheet pan lined with silicone baking mat (preferred method). You can also line the pan with parchment paper or use a good non-stick cookie sheet. If you want, draw 4-inch round circles on a sheet of parchment paper, and place it underneath the silicone mat to use as a pattern. If not using the silicone mat, you can just use the parchment paper by itself, making sure you flip the paper so the drawing is on the bottom side and doesn’t come into contact with the cookie batter. Drop about ¾ tablespoon of batter onto the sheet and spread into a circle using the bottom of the measuring spoon. Even out the thickness with a small off-set spatula, making sure that the thickness is even, and most importantly, that the center is not thicker than the edges or your cookies might not be crispy in the middle. I recommend only making 3 pieces at a time because the cookies need to be hot in order to be shaped. These cookies don’t spread in the oven, so they can be close together. If desired, sprinkle your decoration of choice along the edges of the cookies. Bake for about 8-10 minutes or until the browning has crept in beyond the edges towards the center of the cookies. As soon as the cookies come out, use a spatula to flip one cookie, place the fortune inside and fold it in half. Grab the cookie and gently press the center of the straight side of the cookie on the edge of a cup to create a fold and place the cookie into a muffin tin (or any small cups) to hold the fold until cool. Repeat with the remaining cookies. Note: If this is too hot on your fingers, you can wear latex gloves or kitchen gloves to help ease the heat a bit. After making the first batch, let them cool completely and check if they’re crisp, especially the middle. If not, you may want to make them a little thinner or bake them a little longer. You can also make them crispy by putting them into a 275F oven for 7-10 minutes to dry them out. They will unfold after reheating, so you will need to reform them. Let cool completely before packing them into an air-tight container. Make sure the container is airtight in order to keep them crisp for a long time. Join us on Patreon for bonus content & rewards!